Most episodes of ARIA cerry important messages and lessons in life. We could say Amano-sensei is the real-life optimist much like Akari. Having just finished re-watching ARIA the Animation, I've compiled the messages which each episode carried. The exception is the ARIA-shachou mini episodes which I couldn't really derive one. It takes effort to like what you dislike but if it is done, what you previously disliked may become something very important to you. When ordinary scenes are seen differently, one may see something important that is not seen normally. One should go with the flow rather than against it as it is far more comfortable to do so. A letter can overcome time and place to deliver your heart. Memories can be forgotten but are not discarded. They are tucked away deep down in your heart and can be brought back by triggers. “A world looks wonderful, from the eyes of a wonderful person” – The way you see the world decides how wonderful (or not) the world is. We may be supported by something/someone without even realising. A person close to you may keep telling you off because that person truly cares for you. You control your own thoughts. By changing your life’s attitude, you can enjoy anything in life, even obstacles. A little relaxation is necessary in order to overcome harsh conditions. Time is something that changes everything, sometimes in a kind way, sometimes cruelly. It would be a waste to be caught up with the fun of the past, to not realise the fun of the present. Events that are truly fun/enjoyable cannot be compared with each other. Fun is born and disappears constantly. If you can catch every one of them, you will never run out of fun. If you find something fun right now, it is something which you can enjoy the most right now. Things change with the flow of time, but there are some things which never change. Things that are precious because it changes over time and things that are precious because it stays the same – both are equally precious. Doing things yourself is fun! The New Year gives a clean white sheet. You decide on the colours! 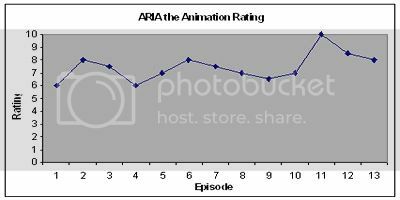 I tried giving objective (non-fanboy influenced) ratings on The Animation and came up with an average of 7.46. And those were the "messages" what changed my life, and my view of world. Oh, I can't tell how I want to thank Amano-sensei personally for changing my emoish personality to a real optimist. And yeah, I read somewhere an interview with Amano-sensei and she is as optimistic as Akari. i signed up to this "google/blooger" thing just so i can comment on ur posts. I love reading ur posts, and really want to go on a trip to venice as well, after reading/watching ARIA. Hope u can continue with your posts. You're welcome, the more the merrier when it comes to blogs really!